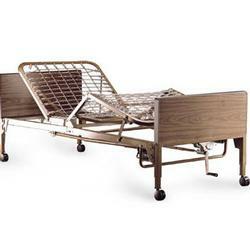 These home-quality hospital beds are an economical solution for those requiring some bed positioning. We carry a wide selection of electric home-quality beds, semi-electric beds and manual home-quality bed frames and an array of mattresses and accessories to meet your needs. Our selection combined with a expert staff advice, free shipping and 110% price match guarantee, allow you to make your purchase with confidence. Brands include Invacare, Medline, Hill-Rom, and Drive. 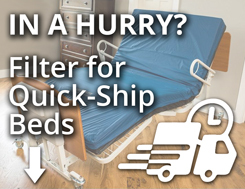 Time to pick a frame for your home-quality bed, also known as a hospital bed. Choices range from manual to full-electric. Factors in the choice include user needs, caregiver availability, cost and comfort. 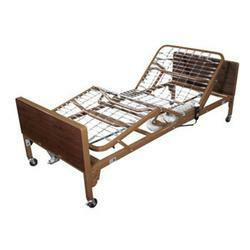 Manual Bed Frames - These beds are just that, manual. 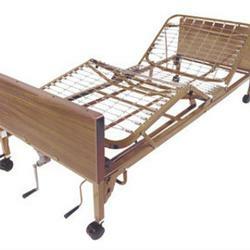 All functions such as raising and lowering the head or adjusting the height of the bed are done with a hand-crank. These home-quality beds are appropriate when there is someone around who can make the adjustments and when cost is a factor. Semi-Electric - A semi-electric bed is a choice that increases function and independence while still being sensitive to cost. A semi-electric home-quality bed has electric controls for raising and lowering the head and feet but a manual crank for adjusting the height of the bed. Full-Electric Home-Quality Beds - These beds do it all with a touch of a button, giving the bed-user full control and independence. All adjustments are made through the electric controls. And don't worry, both semi and full-electric beds can be adjusted manually in case of a power outage.